Human wants are unlimited but the resources available to meet those needs are limited. The fact that wants are unlimited tends to engender a situation in which your income is not enough to cover your expenses. When income is not enough to cover expenses, people tend to borrow money to make up the difference. The borrowed money when not properly managed tends to become debt, which sinks you further into a financial rut. Many people are living from paycheck to paycheck because they have a huge debt burden from student loans, mortgages, car loans, insurance, and utility bills among others. However, instead of being dismayed by your financial condition, you can take solace in the fact that recent history is replete with stories of people who escaped the financial rut by taking decisive action. 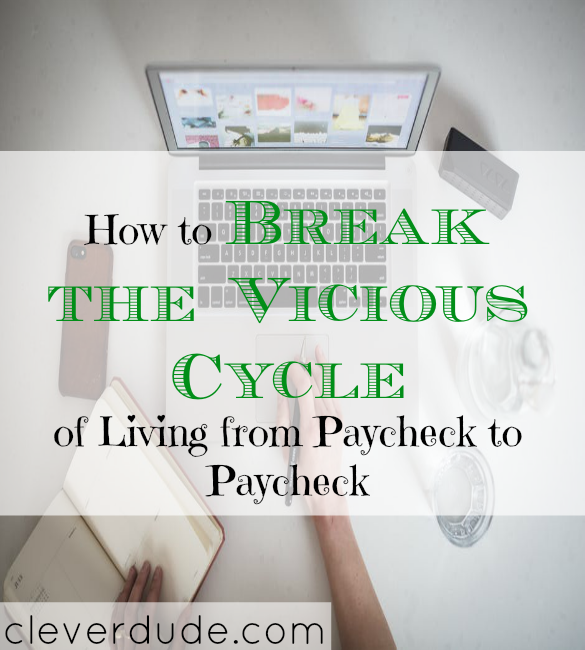 This piece provides insight into four actionable tips to break the cycle of living from paycheck to paycheck. The first step towards breaking the vicious cycle of living paycheck-to-paycheck is to take the time to understand how your finances work. You need to know exactly how much you earn (income) and know how much you spend (expenses). As incredulous as it might sound, some people don’t really know how much they earn. You need to take the time to understand your final take-home pay after taxes, 401Ks, retirement, and insurance premiums have been deducted. It is easy to make financial plans based on your gross income instead of basing your budget on your net income. To know the exact dollar amount of your expenses, you should take the time to write out ALL of your expenses over a period. Committing to writing down your expenses for 3 weeks should give you a fair representation of your expenses. After taking the time to take stock of your finances, you’ll need to take your financial prowess further by taking the time to create a budget. The smartest way to create an effective budget is to think beyond bills to think about everything that takes money out of your budget. The effective budget should include the usual bills, gas, pet food, clothing, and toiletries among others. An effective way to budget is to use the old-fashioned envelop budgeting system in which you’ll split all the different expenses into different envelopes. You can adopt a modern solution by creating different savings account – you’ll have different accounts for rent, utilities, groceries, and emergencies among other things. When creating your budget, you could observe that your income is not enough to cover your expenses. If you don’t have enough money to cover your expenses, a simple solution will be to find ways to cut the excess from your expenses. If you are already funding the difference between your expenses and your income with debt, you’ll also need to cut your expenses. You can start trimming expenses by reviewing your non-essential needs. If you have a Netflix account, you might not really need cable TV at home. If you use a smartphone, you might not need broadband internet at home unless you telecommute to work. You should also review expenses that have health implications such as money spent on cigarettes and alcohol. Debt is a serious financial trap that could keep you perpetually broke and it could cause you to always live from paycheck to paycheck. Start by taking stock of all your current debt and liability so that you can know how much money you owe. The next step is to stop taking on additional debt, you may need to cut your expenses (see 3). You should then start paying off your debt, starting with the high-interest debts such as credit card debts. If your debt burden appears to be insurmountable, you might need to consider debt management solutions such as debt consolidation and debt settlement. Good article. I agree, to get a handle on your expenses you need to write them down. Then take stock on which debts can be paid off first. One thing to think about is whether any of the interest can be written off on your taxes. Sometimes the higher interest rate debt may not be the first debt to pay off.